Herbal skin care products can benefit the skin in many different ways. 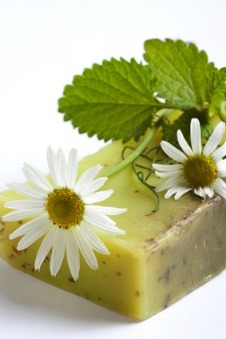 This herbal skincare page provides herbal soap recipes that can be made in your own home. Sage is a useful herb for skin cleansing, stimulating blood circulation in the skin, tightening skin pores, and restoring the elasticity of the skin. It can be used for skin that is oily or for wrinkled and sagging complexions. Camphor also stimulates blood circulation and has anesthetic, antimicrobial, and anti-inflammatory properties. Start by melting the soap base. Combine the melted soap and herbal ingredients. Stir until all the ingredients are blended together and pour the herbal soap mixture into molds. Keep the soap wrapped or store it in a cool dark place to keep it fresh. The soap will be good for about one year and a half. Rosemary is an herb that is great for herbal skin care. It refreshes the skin and can be used as a toner and astringent. It stimulates blood circulation and restores the elasticity of the skin, which decreases naturally as we age. Rosemary is effective on oily skin and also possesses antibacterial action and therefore can help with acne. Spray the mold with a vegetable spray to prevent sticking. Melt the soap base and combine with the milk. Add the rosemary essential oil and mix well. Pour the soap mixture into the mold. After a couple of hours, push the herbal soap out of the mold and slice it into round soaps. Note that rosemary oil is not recommended for people with high blood pressure or epilepsy. The nettle herb is good for oily skin and has cleansing, clarifying, and emollient properties. It is also suitable for sensitive skin. It is useful for treating and preventing dandruff. Melt the soap and mix together all ingredients and pour into molds. Once cooled, pop out the herbal soap out of the molds and store the soap in a cool dark place. Lavender is a good herb to use in herbal skin care products for normal or dry skin. Melt the soap over heat with the water. After the grated soap has melted, add vitamin E oil and all the remaining ingredients. After the soap has cooled and thickened, scoop out a small handful of the soap and roll into a ball. Flatten the ball to create a disk shape. As the soap cures, press the soap into a firmer and smoother shape. Mix a little orange oil on your hands and polish the soap smooth. This soap will discolor if the lavender buds are added too soon to the melted soap and so they should be added just prior to removing the mixture from the heat. Peppermint is a good herbal skin care product becaus it cools, refreshes, and stimulates the skin. It helps restore skin elasticity, tightens pores, has anti-inflammatory properties, and reduces skin redness and irritations. It is good for oily skin. Melt the soap base and add mint leaves and fragrance oils. Pour into molds and let the herbal soap product harden. Chamomile is very soothing for the skin. It is an ideal herb for irritated or sensitive skin and helps with irritation of the scalp. Rose petals have cleansing and skin toning properties. Rose petals help to hydrate and moisturize the skin and are ideal for dry, aged, or sensitive skin. Combine the distilled water and orange flower water in a saucepan and bring the mixture to a boil. Remove the pan from the heat and add the peppermint, chamomile, rose petals, and orange blossoms. Let steep for 1 hour. Strain the herbs and flowers from the water and reheat gently. Add the glycerin soap and stir in the castor oil. Let cool to room temperature and bottle.